1. Slow Travel – This type of travel occurs when there is no strict start or end dates. Since you are no longer capped to a set number of vacation days per year, you can stay at your destination for longer periods of time during off-peak seasons, and ultimately spend less money. Slow travel gives you the ability to see all the well-known tourist sites, while providing a deeper sense of community since you will be getting to know the people and culture of a place much more intimately over an extended amount of time. Consider slow travel if you prefer to keep the cost of accommodation and transportation on the low end of your budget. 2. 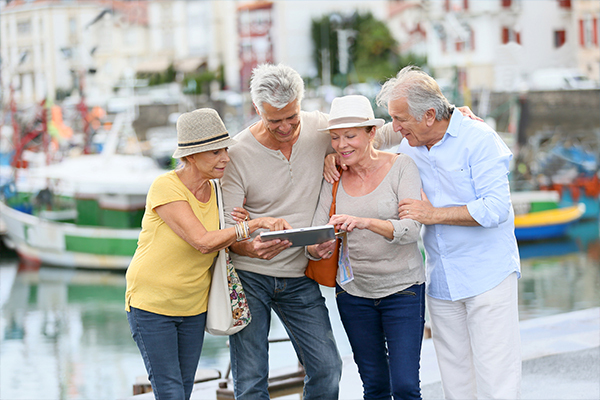 Multiple Location Tours – As a new retiree, why visit just one city or country when you can book tours that include multiple locations? Get more value for your dollar and explore different countries within the same region. For example, if you’ve always wanted to travel to Spain, take the opportunity to go to the neighboring country of Portugal on a multi-country tour. Traveling to different locations on the same tour also highlights the distinct culture of each place. You’ll easily notice the subtle (or stark) differences when it comes to food, entertainment, and daily life. 3. Cruise and Land Tours – Explore the best of land and sea with a tour that combines both! There are some things that are best observed from the water, such as taking in the grandeur of glaciers and life on the banks of a river, and you can take advantage of vacations that use various transportation methods. A good example is experiencing the raw nature of Alaska’s glaciers and wildlife on a ship, while stopping at famous photo spots to get the perfect landscape picture. 4. Transatlantic Cruises – A transatlantic cruise is the ultimate retiree experience! Lasting about three to four weeks, these tours stop at various ports both in the Caribbean and in Europe, and include multiple days at seas. They also require minimal effort from you because there is no need to repack luggage, or worry about transferring your belongings from the ship to hotel and back again. Be as active or relaxed as you wish, while having plenty of restaurants and amenities to enjoy at your leisure. 5. Price over Convenience – In the past, you may have had to compromise on price in order to travel during common holiday periods – summers, three-day weekends, New Years, etc. If you are willing to be flexible, you can now take advantage of great travel deals at any time of the year. You have worked hard throughout the years and your retirement should consist of activities you love, with the people you love. If you are looking for your first post-work vacation, leave the logistics and planning to travel experts by choosing a guided vacation where all the details are handled on your behalf. Enjoy the freedom you now have to see multiple countries at a pace that makes the most sense for your lifestyle!